Any wearers - Merrell Barefoot Pace or Barefoot Pure Glove? I'm looking forward to summer travel and was wanting an airport-friendly minimalist walking shoe that's easily removable - but also serves well throughout the time at destinations in terms of a tourist's walking comfort. Does anybody own/wear these? Would you buy them again? Thoughts on them as candidates for travel shoes? Yep! These are the most comfortable shoes I have ever worn straight outta the box. My moccasins are more slipper-type shoes than these fellows, so I use them for short walks and uses. Plus, moccasins were pricier, so I wear the Merrell style shoe (the one at the top) for hiking, work, trail running, long walks and moccasins for school, lounging, running out to the dep etc. I used custom moccasins too; advantage with Merrells is they stay with your foot like a glove and never slide around your foot when the trail gets off camber. Nice about the EB site! Good for future reference. My Pace Pure Gloves fit my typical shoe size well, and I ordered them online. I suppose that I was lucky! Probably the main advantage is that these can be very securely fastened to the feet, which works better for quick sprints. Thin sole? It looks like Chuck Taylor soles are rather thick, to me. 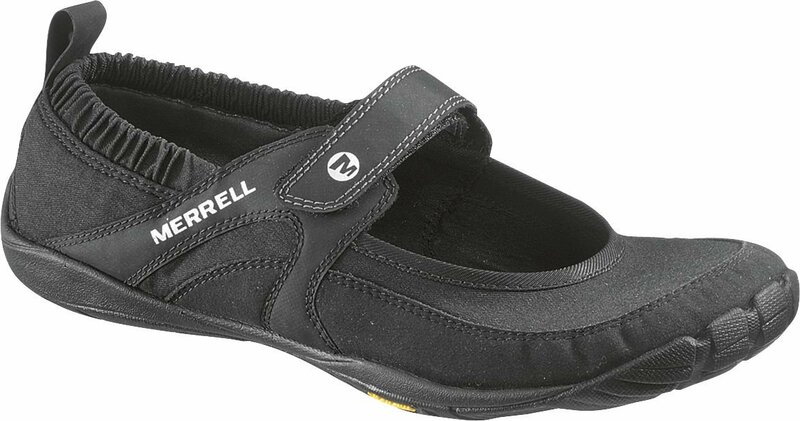 The Merrells' soles are just millimeters thick - you can feel individual pieces of gravel through them. I ultimately got the Pace as an all purpose exercise shoe - love it so much (SO COMFY) that I could very well end up getting the Mary Jane style, too. I was able to stack a couple of coupon codes and get the $100 Pace down to $65 or so. Mine just arrived and I LOVE them! Thanks again for posting. I had no idea I could marry the barefoot thing with cuteness. I'm so happy to find these! There's a little mountain landscape icon just above the 'compose' field when you go to create a question/answer. Your picture will need to be hosted somewhere on the web (in other words, have a hyperlink). Well, it's hard to describe. In effect, there isn't much in the way of arch support. However, due to how the foot bed is shaped and how your foot lays in the shoe, your arch aligns and is comfortable. I always find that my feet collapse in when I wear vibrams, but that I have a perfect arch when wearing the Merrell's. (I have almost no arch, so it's a noticable difference). How much arch support is there? Don't know but I am so buying that second pair! I hate the look of vff's so I'm thrilled to see these. So cute!! Thanks for posting. Cuteness is a legit pro! The Merrells are fantastic. I am using the Trail Glove as both my main running shoe and as a casual kick around shoe too! Very comfortable, and you can blend in without wearing "those toe shoes." They are very well constructed, just make sure you get the right fit, it can be a little weird if you are between sizes. The thing I like most aboth them is that while the sole really feels protective when running over rocks and trails, it really feels like you are walking around in socks the rest of the time. It is really easy to forget that you are wearing shoes at all. One thing to notice is that with a super thin sole and no heel, all of your long pants will suddenly be too long. I plan on getting a pair of the tough Gloves for work, and I think I'll need to get all of my pants hemmed. I bought the Pure Glove for the same reason: several big trips planned this summer and I needed a lightweight but comfortable shoe. I really like these, they are very comfortable and look cute with jeans. I think the sizing is a little weird. I usually wear a 7 but that size felt really big so I went down to a 6 1/2. The 7 was slipping on my heel and felt really loose, the 6 1/2 is much tighter but I like the fit. I also got New Balance's shoe with the vibram sole. I don't know the name. Also very comfortable shoes but I have had trouble breaking them in because they ride a little high on my heel. Eddie Bauer now sells them and has a 20% off thing going on right now - you could get them for $80. I wore out a pair of Pure Gloves. I loved them at first but as they got wet/worn they became stiffer and less comfortable. Also not nice looking! and I absolutely L O V E them! I first bought them thinking I'd wear them when shopping, etc., so I'd look more "normal" but after wearing them a few times I couldn't bear to take them off. They've taken a worse beating than the Pure Gloves and still look/feel great. I like not having to tie/untie laces and my toes love the freedom to move around without suffering when I walk over sharp gravel. Aforementioned gravel is about 80% of the footing around here and another 10% is sugar sand and teeny gravel that used to get into the Pure Gloves but can't get into these. No more stopping every 10-15 minutes to get stuff out of my shoes! I purchased both types and love them! I have tried all the specialty shoes(earth,rebook,sketchers, nike free) and these are the most comfortable to work in (I work in a hospital 12 hour shifts) and I have been running in them also... they are very comfortable... my calves took 2 runs to get used to the new style of running! I have tried these on a couple of times and never actually bought them - either style. Depends on what you want, but if you are looking for a "barefoot" style shoe, then be aware there is a pretty strong built-up "rocker" kind of thing that is part of the sole under the ball of the foot and that is why I keep putting them back - it just really irritates me. Might not bother you at all, but you need to be aware and try it out carefully. My wife has a pair of the pace, and the back is a bit stiff for quick slip on. She tried a size a bit larger initially, but did not stay in place so she had to go to right size. I just flew across the country with the Inov8 195 and they were perfect for slipping on and off. Also love them for workouts. I own the male counterpart, the "True Glove" and like the fit and feel. I would recommend that you wear them around for a couple of days to get the feel of them before embarking on any long journey, however. I had to 'break' mine in a little as the back of the shoe rubbed against my Achilles a bit for the first few days. I now wear them around all the time (when it isn't SNOWING at the end of April in Wisconsin...BAH!) and only wear my VFFs at the gym. I have both. Just had to order them 1/2 size bigger than my usual shoe size, however. The second pair is good for work, looks cute with trousers and with tights. The tennis shoes I wear to crossfit and for running. From a fit perspective, the pure glove is going to be a trouble unless you have a retailer who stocks it so you can try it first. I have the male version of the pace. It's absolutely rocking. I'm not into the whole look goofy for the hell of it scene so I use them instead of my VFF just about all the time. They run a little long so go a half size down from your normal running shoe size. I own the men's barefoot shoe, the trail glove. I love it! There was a 10 or so day break-in period, but after that it's my defacto shoe for wearing when not at work. I really noticed a difference between new and broken-in, there's a lot of padding that's worn away and now it's really an awesome shoe. I'd wear them for traveling, I'd just be wary of long times standing on my feet. I figure in the next 3-6 months I should be better for long periods of time (5+ hours), but right now anything like that makes me want to put my feet up and relax. I was actually looking at buying at least one more pair, the men's tough glove for more of a dressed up look. Just need to try them on, as I understand there's a bit of a difference between each of the models. Oh, and FYI, if you have wide feet you might want to go 1/2 size bigger...at least, I find that true for the men's models. These would be great - that second one is cute enough to wear at work with business casual. I have the Pace Glove and ADORE them! So much so that I bought their Life Delight's in black for work (although they actually feel a lot different). The Pace is literally a glove for the feet, fits the shape of my foot nicely and feels like a part of me. Extremely lightweight and gives me protection while still letting me feel the ground, pebbles, etc. I wish they made them in all black so I could wear them in the office. You can throw them in the wash and they clean up really well. Probably my all-time most comfortable shoe! I got them in my exact size and they fit perfect. I wear the Pure Glove every day at work. I'm on my feet all day, and these have been super comfortable. They look better with office-casual than the other options I've tried. I also have a pair of the pace gloves I wear the rest of the time. Love them both. I do wear thin socks with them. All my life I've been told I had "flat feet', and was always steered towards thicker-soled shoes with rigid arch supports. My feet were always killing me, no matter how much I spent on fancy inserts. It took awhile to get used to these shoes, but now, about 8 months later, I feel like I have 'natural' arches, and my feet never hurt anymore. Walking is a pleasure again. I backpack and hike BIG mountains in the True Glove. Tough, natural gait, light, and fast. Use VFF too, but the Merrells for tougher conditions. tell me the pros and cons between these and some good old handmade moccasins? I just got the Newton's and am really enjoying them. I put allot of miles down, and think the forefront "lugs" or padding make a big difference.